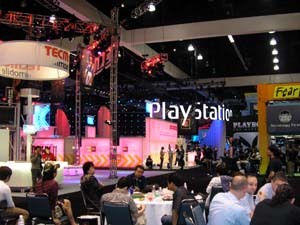 A view inside E3, a riot of sensory overload. As you can see, 15 of the 16 original invitees were able to attend. The one exception is Masashi Oiso, who had to bow out due to school responsibilities. He is being replaced by Masashiro Kuroda, the second-place finisher on the APAC Ballot. This year's field marks a fairly substantial turnover from last year. With Oiso unable to attend, only four players (Maher, Budde, Romao, Lebedowicz) are making return trips this year. The rest of the field isn't entirely Invitational rookies, however. Antoine and Olivier Ruel, Tsuyoshi Fujita, and Gabriel Nassif have appeared in previous Invitationals. Over the years, 84 different players have been invited to the event. So which players have been the most? None other than Jon Finkel and Chris Pikula, tied with six (each are winners as well, with their likenesses immortalized with Shadowmage Infiltrator and Meddling Mage, respectively). Close on their heels are five-time participants David Price, Gary Wise, Mike Long and Kai Budde, who makes the five-timers' club with his appearance this year. Maher, Romao, and Olivier Ruel are all going for the third time. Fujita in Cape Town at the 2001-02 Invitational. The preliminary rounds of the Magic Invitational will consist of 15 matches (best two out of three) with each player facing off against every other player once. The two players with the best record at the end of the 15 rounds will meet in the finals. The finals will consist of three matches (best two out of three games each) with the two finalists playing three of the five formats. The winner will be the first player to win matches in two formats. Order of these final matches will be predetermined but can be changed if agreed upon by the two finalists. All of the matches at this year's Invitational will be played on Magic Online. The 15 preliminary rounds will consist of five different formats: three Constructed and two Limited. Each format will be used for three matches. 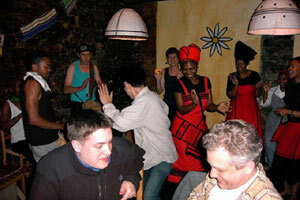 1) Standard – This format will be Standard as it will appear on May 1, 2005. 2) Online Extended – This format will use all of the expansions available on Magic Online. 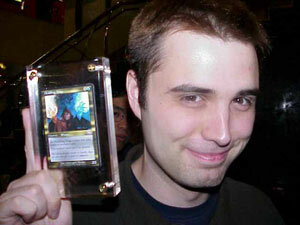 Chris Pikula shows off his Meddling Mage. The 17 selected decks will be auctioned off amongst the competitors. The person who successfully bids on a deck in the draft will play that deck for all three rounds of this format. The auction will work as such: Players will randomly be numbered 1-16. The first player (number one) selects one of the 17 decks. He must then place a bid on the nominated deck. Bids must name a starting hand size and starting life total (eight cards, 25 life being the starting bid). The next player must pass or declare a lower bid. If a player passes, they are removed from the remainder of the bidding for the current deck. Starting hand size is considered the primary bid, with starting life total secondary. This means that a bid of “five cards, 20 life” is considered lower than a bid of “six cards, one life.” The player with the lowest bid plays that deck in the tournament. Players may not underbid themselves. After the bidding ends, the next player numerically who has not yet nominated a deck (player number two if he did not take the first deck, for example) selects a new deck. If all players have nominated decks, the nomination returns to the player with the lowest number. After all 16 players have drafted decks, the auction ends. If you've done the math, you've realized that this means one deck will not be drafted. For more information about the Auction of the People decks, see below. Aaron Forsythe takes a break from the grind of working at E3 2004. 2) Vanguard Sealed – This format is a Sealed Deck format with one twist. It will be played using Vanguard. After constructing their decks, each player will choose an avatar. The three matches will then all be played with the Vanguard starting hand size, starting life total and special abilities associated with the chosen avatar. The sealed product for this event will be one Champions of Kamigawa tournament pack and two Betrayers of Kamigawa booster packs. If you're not up to speed on the available avatars, Bennie Smith's "Into the Aether" over the last three weeks has outlined what you can play. With almost 1200 decks submitted, we had a lot of interesting options. As I said in the original article asking for decks, we were judging based on creativity, entertainment, and playability. Because of the auction structure, power level was not horribly relevant. In addition, we weighted our choices toward decks with more interesting word choices. All of the deck graders were told, the more common the word, the higher the bar needed to be set. Last May, Bob Maher (nicknamed “The Great One”) won the 8th Annual Magic Invitational and earned the right to make a Magic card. He submitted a 2/1 creature for BB with the ability "During each upkeep you reveal the top card of your library and must pay life equal to the card's converted casting cost and put it in your hand." Since you'll have to wait until May for this year's Invitational, that doesn't mean you have to go without any Invitational coverage. After all, we have eight years of history to tap into. Last year, for example, I wrote an article that told the history of the Invitational. Along with recapping each event, this article includes links to all previous online coverage of the Invitational. In addition, here's a link to all of the tournament reports written by Invitees posted on the Wizards web site. We're even including two tournament reports by yours truly. Please join us Tuesday, May 17 for the start of this year's Invitational. Remember that in addition to the winner's card, we will be letting the readers choose a card from among the remaining 15 submitted to be printed in a future set (although without the player's picture in the art or the sly flavor text reference).